Kid: Dude, Nietzsche is cool. Kid: Dude, that's not cool. Nietzsche: Hey, kid, watch out what you say about my will-to-power. That's how the conversation would go. Is Nietzsche cool? Well, if you call a highly sophisticated philologist with a penchant for Ancient Greek Philosophy cool, then I guess Nietzsche is cool. Nietzsche is highly misunderstood. I read Nietzsche's The Gay Science (no, not that "gay," but gay in the old-fashioned way meaning "happy") for the first time in a philosophy seminar back in my college days. We read the Walter Kaufmann translation (the one I still refer to). I remember at the start of the seminar one guy who was especially excited to be reading Nietzsche as if he were to embark upon an expedition in cow tipping while on acid. "Dude, Nietzsche is all about 'God is Dead.' I totally dig that, man." The guy wanted us all to know he was a nihilist: he cut his forearms for show and he wore stark black; which was OK with me, considering black was a decent choice of color to absorb heat in the Winter. The professor, who was a very quiet man, a little intimidating, and spoke in a low, almost condescending tone interrupted the guy. "Don't think you understand Nietzsche without reading him. 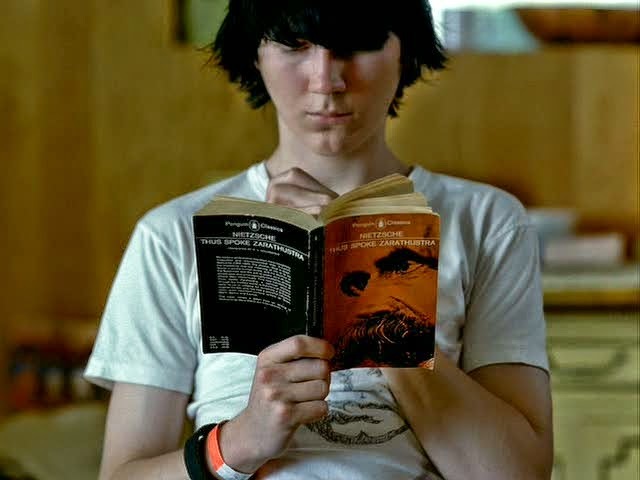 Reading Nietzsche is not cool." It is true that Nietzsche mentions "God is dead" bit in the Gay Science. The book is written as a series of witty, short anecdotal chapters, with an appendix of verse at the end. "The God is dead" piece is paragraph 125, "The Mad Man." The story is simple. A man races through the streets of a city in broad daylight carrying a torch, proclaiming "I seek God! I seek God!" The atheists - "the many who do not believe in God" - stand around and laugh at the madman. "Is he lost?" they ask. The madman gets right up in the faces of the atheists and asks them, "Whither is god?" The atheist continues to laugh but the madman continues, "piercing them "with his glances." The madman makes a claim that the reason God is dead is that we've killed him. "I shall tell you. We have killed him--you and I. All of us are his murderers." The madman goes on for a few paragraphs about how we killed God. down left? Are we not straying as through an infinite nothing? Do we not feel the breath of empty space? Has it not become colder? Is not night and more night coming on all the while? Must not lanterns be lit in the morning? Do we not hear anything yet of the noise of the gravediggers who are burying God? Do we not smell anything yet of God's decomposition? Gods too decompose. God is dead. God remains dead. And we have killed him. How shall we, the murderers of all murderers, comfort ourselves? What was holiest and most powerful of all that the world has yet owned has bled to death under our knives. Who will wipe this blood off us? What water is there for us to clean ourselves? What festivals of atonement, what sacred games shall we have to invent? Is not the greatness of this deed too great for us? Must not we ourselves become gods simply to seem worthy of it? There has never been a greater deed; and whoever will be born after us-for the sake of this deed he will be part of a higher history than all history hitherto. Here the madman fell silent and looked again at listeners; and they too were silent and stared at him in astonishment. At last he threw his lantern on the ground, and it broke and went out. "I come too early," he said then; "my time has not come yet. This tremendous event is still on its way, still wandering-it has not yet reached the ears of man. Lightning and thunder require time, the light of the stars requires, time, deeds require time even after they are done, before they can be seen and heard. This. deed IS still more distant from them than the most distant stars and yet they have done it themselves." It has been related further that on that same day the madman entered divers churches and there sang his requiem aeternam deo. Led out and called to account, he is said to have replied each time, "What are these churches now if they are not the tombs and sepulchers of God?" Like a character in a play, Nietzsche puts the words "God is dead" into the mouth of his interlocutor, the madman. Nietzsche the philosopher is not saying emphatically, "I, Nietzsche, am saying God is dead." A facile interpretation such as that will lead you nowhere in a close reading of the text. The madman does indeed say, "God is dead" further into his rant. He says "God is dead" not as a statement of belief but of accusation against the atheists standing around in the street. The madman's rant is NOT glorification of atheism, but rather, it is a criticism of the atheist's hypocrisy. The madman says, "God is dead. God remains dead. And we have killed him," he is addressing the atheists, not the reader. A misread of the text could lead one to believe "God is dead" is an accusation against Christianity, but this is only half true. The obvious brunt of the madman's cries is addressed to the atheists. Why? Because they say they have killed God while still holding onto God. God deserves a burial if he is truly dead. The hypocrisy of the atheist (read here, "the scientist") is he kills God while still holding fast to the notion of God as being. The death of god is a charade for Christian metaphysics still pervades. Nietzsche's distaste for Christianity, it should be stated, is a distaste for Christian metaphysics which he sees as "Platonism for masses." The parable is really an indictment of modernity. We do away with the notion of Christianity in the West (oh, we happy atheists) but remain driven by a Christian ethos. We take the name "god" away from our actions but our ambition is still the same: namely to preserve being qua being. Nietzsche calls the atheists out as hypocrites. When Nietzsche talks about unchaining the earth from its sun, he is talking about the power of reason, what Descartes calls the cogito, the principle of the "I think" that sets man apart from the animals. How can you kill God but retain the same metaphysical stance? In other words, what Nietzsche is saying is, how can you say "God is dead" but retain the status of man as rational being? How can you discard God - i.e., Being with a capital "B" but still continue to follow the same ontological rules. The atheists predicate nothing new downsizing God; they instead suppress God and call it reason. The proof is in the pudding. We do away with "God" in language but replace "God" with whatever metaphysical category strikes our fancy. The modern man does away with the naming of God but he himself remains un-transformed. The nominal killing of God is like the superficial spraying of roach poison. To get at the problem the exterminator must destroy not the roaches roaming the floor, but the critters beneath the floorboards as well. To kill god effectively, it cannot be merely a nominal homicide, but a metaphysical murder. Try this inner thought experiment. If I say god is dead but cannot press the button - zap, he is dead - then I am deluding myself. But, I stray from the text. Nietzsche is saying we have only killed God half-way. We didn't go through with it completely like we should have. When Nietzsche poses the question, "Is not the greatness of this deed too great for us?" what he implies here is that it is too great of an ambition to completely go through with ridding ourselves of traditional ontology. We linger at the funeral. The smell of God's decomposition is too rank for our traditional noses. The madman walks away sad at the end of the narrative. "I come to too early," he says. What does he mean by this statement? Is it because man is not yet ready to completely do away with the notion of God? Are his listeners too wrapped up in their own astonishment to pay heed? And what is the reason the madman carries a lamp in the broad daylight? I did not notice this detail the first time around. But it is obvious it is not night time. It is broad daylight and the madman is running through the streets with a glowing lantern. Is his coming early connected to the time of day he comes? Are we still at the beginning hours of human history? Perhaps Nietzsche thinks man is still a babe clinging to the mother milk of substance? This deed is still more distant from them than the most distant stars and yet they have done it themselves. The deed - the killing of god - is "more distant from them - those who do not believe - than even the most distant stars - and yet we say we have done it, killed god. What Nietzsche is saying here is that the metaphysical project inherited from the Greeks is still a legacy we have not yet been able to slough off. To do so would be like pulling oneself up from one's own boot straps, as the saying goes. Nietzsche prefaces Heidegger here. Heidegger will cast the problem in a different way. Heidegger will do the deed by recasting the entire history of metaphysics from a project of being to a project of becoming. But, that is another story. Nietzsche does not give us the language to effectively mop up God's entrails. He leaves that task to later Continental Philosophers.